Introducing the Year of the Horse! UPDATE 1/10/14: Due to extreme flooding Oshogatsu has been postponed until Sunday, January 19, 2014. If you have already purchased tickets you will receive an email with details about your purchase. Otherwise, you may still purchase tickets online until Friday, January 17th at noon. We apologize for any inconvenience and hope to see you all there next Sunday! It’s that time of year, fans, where we gather together with family and friends, reflect on the year that has passed and look forward to the one to come. The holiday season can be a blur of activity, but it all culminates in one of our favorite events – Oshogatsu: A New Year’s Celebration! The New Year is Japan’s most important and celebrated holiday, and many traditions and activities are included in the festivities. To get you prepared for our upcoming New Year’s festival, we’ll be explaining one or two of these traditions each Friday until January 12th. Check back each week to learn more about what makes Oshogatsu so special, and how we’ll interpret these traditions at the festival. Every year is named after one of the zodiac animals, and this year we celebrate the Year of the Horse for those born in 1930, 1942, 1954, 1966, 1978, 1990, 2002, and 2014. The zodiac was introduced to Japan from China and there are several tales of how the animals were selected and in what order. One of the most popular stories finds Buddha calling all the animals of the world to come to him on New Year’s Day. As a reward, he promises each one a gift. Only 12 animals came and each one was given the honor of having a year named for them. Their arrival time marks their esteemed position in the twelve-year cycle, with the rat always first and the boar forever last. People born in the same zodiac year are thought to share some of the same characteristics. Those born in the year of the horse are said to be skillful in paying compliments and in handling money and financial matters. They are also supposed to be talkative, quick thinkers, wise and talented. Horse people may also anger easily and be impatient. For the upcoming year of the horse, we’d like to introduce you to our Oshogatsu mascot – Uma! We made an origami version of Uma to show her off to you, so follow us on Vine to check it out, or scroll down to see how to make an Uma of your own. 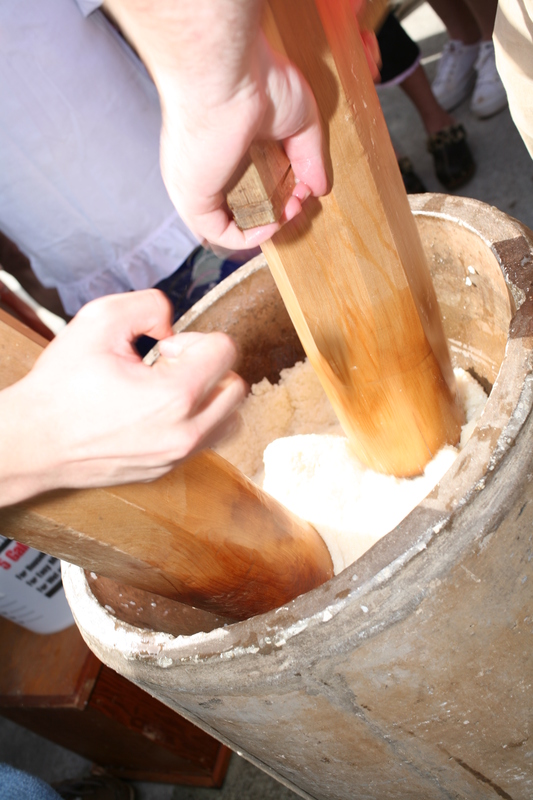 See you back here Friday, 12/20 when we’ll talk about Mochitsuki – the rice pounding ceremony! 成人の日、Seijin no hi is the first national holiday after the New Year celebration in Japan, landing on January 10 this year. With the word seijin meaning adult or a grownup and hi meaning day, it translates as Coming of Age Day. You must be wondering what kind of day this is and why it is a national holiday. In Japan, when you turn 20, you are legally recognized as an adult. You legally can drink alcohol, smoke cigarettes and most importantly you gain the right to vote!!! Since Japanese people traditionally do not celebrate individual birthdays, when the New Year comes, everybody gets one year older. So if you turn 20 during the year, celebrating seijin no hi all together on the second Monday of January is quite a big festival! Since this is a nationwide celebration, Japanese municipalities formally decorate buildings, such as City Halls, with red and white curtains signifying an auspicious occasion. Young men, mostly in business suits, and women in brightly colored kimonos or dresses gather at their local city hall for their celebration. People who have left their hometown for work or study come home to attend the ceremony and at the same time have their High School reunion. The ceremony consists of many speeches from mayors and other notables as well as numerous performances. It is focused on awareness of what it means to be an adult. Congratulations are in the order for our readers in Japan who will turn 20 years old this year! I vote for not heavily drinking or smoking, but it is great to have the right to vote! Growing up in Japan, I could not wait to see the “Kōhaku Utagatsen” New Year Eve program, the most watched TV show of the year. It is a team singing contest between the most popular male and female singers each year. The program has been running for more than 50 years and has become an annual Ōmisoka event. At the stroke of midnight, kane bells at the temples throughout the country ring 108 times. This is called joya no kane. I would stay up to watch joya no kane on TV and eat soba noodles. When we hear joya no kane, people stop their busy activities and calmly welcome the New Year. Here’s a quiz for readers! Why do Japanese temple bells ring 108 times and why do people eat soba noodles on Ōmisoka? The first person with the correct answer gets a pair of tickets to Oshogatsu!